The 15th annual World Wai Kru Ceremony is held tomorrow in Ayutthaya. The city, located around 80 km north of Bangkok, is the ancient capital of the Kingdom of Siam (today’s Thailand). The meaning of “Wai” is greeting. “Khu” means master. It is a ritual performed by fighters before each bout. It is a tradition dedicated to pay respect to one’s teacher, gym and those beloved. It is also a final moment before the battle when a fighter is one on one with his thoughts and spirit. “The Wai Kru festival is an opportunity for Muay Thai practitioners to pay homage not only to those who taught them the art, but also to the masters ranked above them, famous Muay Thai fighters, and the ancient warriors who came before them,” reads Thailand Insider. This includes legendary Nai Khanom Tom, Suriyenthrathibodi known as “Tiger King” (Phra Chao Suea), among others. 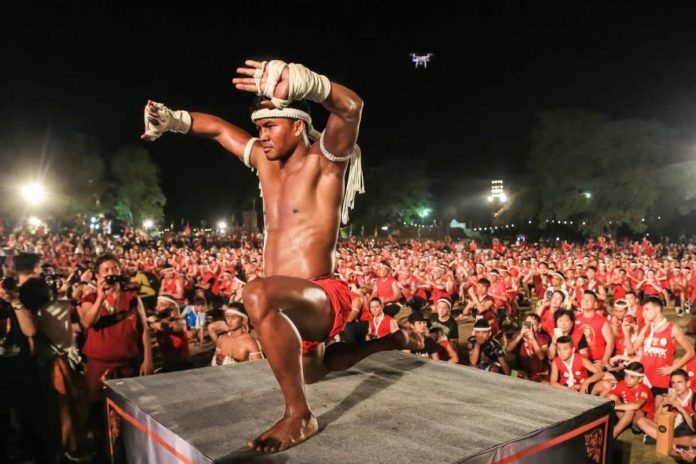 In 2017 famed Muay Thai fighter Buakaw Banchamek led World Wai Kru Ceremony with hundreds of devotees in attendance. This year the spectacle is held on March 17 at sunset against the backdrop of Ayutthaya’s ancient ruins, starting at 6 pm local time.